Phil was born and raised in Erie, Pa., and was a graduate of Cathedral Prep in 2010. He attended the University of Tennessee at Martin (2010-2014) where he majored in exercise science and wellness. He was also a four-year starter on the baseball team. Phil then returned to Erie to complete his doctoral work at Gannon University where he graduated in May of 2018. While completing his graduate studies, Phil joined the Hertel & Brown team, working as a physical therapy technician. Phil’s areas of interest are sport-specific rehab and manual therapy. 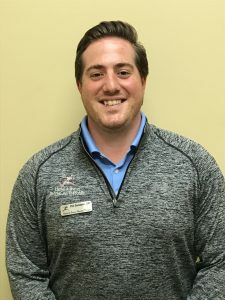 He is excited about joining our team, in his hometown of Erie, and looks forward to taking additional continuing education courses to further his knowledge in his areas of interest.